Push brooms, dust pans, sponges, floor brushes, street brooms, brooms, upright brooms, counter dusters, floor care brushes, floor cleaning brushes. Different fill material: PVC provides excellent water holding, good flicking action, and it resists most solvents. Polypropylene outlasts other fibers and resists oil, solvents, and detergents. Crimped plastic resists alkalis and is stiffened for medium heavy sweeping. Tampico resists solvents, and is good for dry sweeping smooth or medium floors. Palmyra is water resistant, and is a medium stiff material for scrubbing and heavy sweeping. African bassine is a coarse, flexible, water resistant fiber that is very durable. Floor brush prices do not include handles. Order handles separately from the Extension handles page. 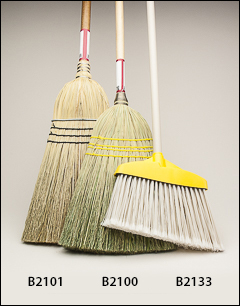 Floor brushes use a threaded handle and street brooms use an unthreaded tapered end wood handle. For smaller handheld brushes, please see our Scrub brushes and Wire brushes and wheels pages. 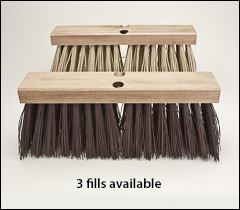 Two fill materials available for fine sweeping. Either flagged gray PVC with thousands of split ends to cleanly sweep fine dirt and dust on your smooth, waxed, or polished floors. Or a horse hair/polypropylene blended border to provide a fine sweep, with a polypropylene center that moves heavier debris. 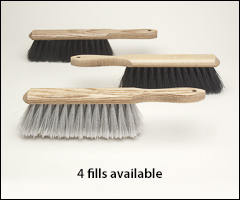 All four brushes have a 3" trim length. Two threaded handle holes. Either polypropylene or tampico fill material for medium sweeping. 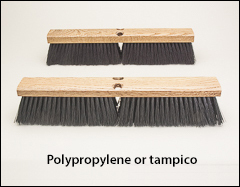 Tampico is well suited for dry sweeping of smooth to medium floor surfaces and is an excellent scrubbing brush. Polypropylene fill is tough and noted for resistance to solvents. All five brushes have a 3" trim length. Two threaded handle holes. Both of these fill materials are heavy-duty, industrial garage brushes. 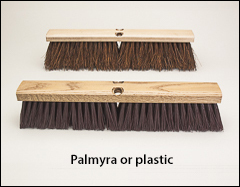 Palmyra can be used indoors or out, for heavy sweeping on both wet or dry surfaces. Crimped red plastic fill provides a stiff sweep. Inert to alkalis and some acids. Trim length depends on fill material. Two threaded handle holes. 16" wide, sanded hardwood block. 5 x 16 rows of fill. 2 tapered handle holes. Palmyra is water resistant; medium stiff for scrubbing and heavy sweeping. African bassine is coarse, flexible, and water resistant. It's a very durable fiber. Polypropylene outlasts other fibers and resists oil, solvents, and detergents. Sold by the case, 6/case. Flagged poly fill material is angled and cleans even the finest dirt. This is a lightweight broom. 12" wide, 48" handle, 54" OAL, 6" to 7 1/2" trim length. Sold by the case, 12/case. The B2100 is a corn and fiber blend, with 4 rows of sewn binding, and weighs about 25 pounds per dozen. B2101 is a mixture of broom corn and palmyra, with 3 rows of sewn binding and a wire band, and a heavier sweep broom that weighs about 36–38 pounds per dozen. Sold by the case, 6/case. WARNING: Proposition 65 Label for B2100 and B2101 . Fill is staple-set into 13 1/2" long lacquered hardwood blocks. 8" long brush face. Polypropylene fiber is long lasting, durable, and resists acid, fungus, and rot. 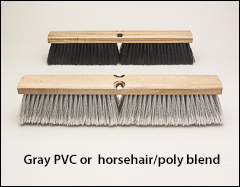 Gray flagged PVC has thousands of ends to cleanly sweep fine dirt and dust. Tampico holds liquids well, is acid resistant, and good for light soft scrubbing. Horsehair border (picks up fine debris) with plastic fill for medium sweeping. Heavy-duty industrial 12" wide black dust pans in plastic or a 20 gauge steel. 3M commercial size sponges. 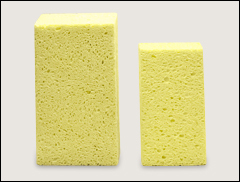 These cellulose sponges are 10 times more absorbent than polyurethane sponges. Cellulose is stronger and less likely to fall apart. Each sponge is individually wrapped.